NBC's Today show loves to promote former administration officials with scathing tell-alls, so long as they're criticizing a Republican president. Tom Brokaw's prodding of George Tenet to criticize the Bush administration's path to war was just the latest example of Today show's love of former GOP administration officials with an ax to grind. Back in 2004, then Today co-host Katie Couric praised former Bush Treasury Secretary Paul O'Neill's book for its critiques of President George W. Bush. However if the tell-all slights a Democratic administration, as George Stephanopolous did with his book, Today takes a decidedly more skeptical tone. Of his 1999 tome, All Too Human, Couric called Stephanopolous' revelations "creepy" and wondered if he was "a turncoat." Tom Brokaw: "We've got the perfect kind of transition from Al Roker and the weatherman to the man who's written a book called Center of the Storm, George Tenet, former Director of the CIA to the Clinton and Bush administrations. He was on the job when this country was changed forever, of course, by September 11th. He was also sitting at the table for the important discussions that led to the war in Iraq. Now after years of silence George Tenet is out with a book of more than 500 pages about what this country knew and when, how safe we are today and about what was going on in the highest levels of the Bush administration before he voluntarily resigned that job. Let me just clean up something here at the very beginning. A very dramatic opening to the book. You have Richard Perle, well known neo-conservative who is an adviser to the Pentagon. You say you see him leaving the White House the day after 9/11 saying, 'Iraq has to bear responsibility for this, what happened yesterday. They have to pay the price.' Overnight, as you know, Richard Perle said, 'Not possible, I was in France.'" George Tenet: "Well Tom I know the conversation occurred. I may have been off by a couple of days. The encounter occurred, the conversation occurred. It reflects what he has said publicly soon after 9/11. So I may have gotten the days wrong but I know I got the substance of that conversation correct." Brokaw: "And what you wanted to leave was the impression, very strongly, that there was a very strong core group that came into office determined to go after Iraq." Tenet: "Tom it is ironic that in the days and weeks after 9/11 Iraq would already be on an agenda item for some people." Brokaw: "And from the CIA point of view, at that point, there was no connection whatsoever between Iraq and the attacks of 9/11?" Tenet: "No there, there was none at all." Brokaw: "Let me ask you a question that occurred to me and a lot of other people who are your friends and admirers and some of your critics as they read this book. In the opening passage you describe conversations in the Clinton administration between the Palestinians and the Israelis attempting to get some kind of new peace arrangement. But the Israelis were demanding the release of Jonathan Pollard, a United States military intelligence analyst who had been selling them secrets. He's in jail for life. You said, 'If you release Jonathan Pollard I'll resign from the CIA.' And yet when you were the head of the CIA you had Condi Rice ignoring your warnings. Vice President Cheney exaggerating the threats repeatedly. Don Rumsfeld and the Pentagon running what effectively was a rogue CIA, his own intelligence operation. And you didn't threaten to resign then." Tenet: "Well Tom I don't, I don't know that I agree with the premise of everything in your question but let me say this, I had a job to do. We had a war on terrorism. We had conflict in Iraq. I,I,I thought I could best serve my country by continuing to do my job everyday. A director of central intelligence is agnostic on policy because we have to become objective and give them the best data possible and I thought it was best to serve my country by staying in my job." Brokaw: "But if the country was not getting the true story which it's fairly clear from your book that it was not. That the Vice President had one clear view of what was necessary in Iraq. That the Defense Department had its own intelligence operation going on and Condoleezza Rice was not responding with alacrity to your warnings, very clear warnings in July of 2001 that an attack was imminent. Doesn't the country deserve to know that?" Tenet: "Well, well Tom I chose to do my job in a way where you stay inside the system, you do your best, you push, you push your objective analysis. You make people aware of what you believe to be true while people think, 'Well why are you talking now? Why, why have you been silent so long?' I certainly wasn't silent within the purview of my job and in the counsels of the administration in terms of what we said and how we said it." Brokaw: "There's an anecdote in your book. In August of 2001, just before 9/11, you went out to Crawford, Texas to make sure the President was seeing all that he should be seeing, given the warnings and the briefings that had been coming from the CIA. You ride around the ranch in his pickup and talk, as you describe it, about the flora and the fauna. Did he ever stop the pickup and turn to you and say, 'Mr. Director what is going on here? What do we have to worry about?'" Tenet: "Well Tom throughout that summer we had those kinds of conversations with the President. The irony is, is that by the end of July the intelligence went fairly silent. We weren't seeing the same kind of eruptive threat reporting we had been seeing May, June, July, August. So in that time period we were in quiescent time period. The President's the one in concert with our own work when, when he was apprised of the imminence of what we we're predicting asked the very important question, 'is it possible that they're coming here?' That was the result of an August 6th, President's daily brief that said he is determined to strike inside the United States. A strategic warning, not a tactical warning. So August was a quiet period." Brokaw: "But at the end of July one of your very best people within the agency has said, 'they are coming here.'" Tenet: "Tom it was eerily quiet that day as we had just exhausted the list of threats we were dealing with and I suspect he was, he was ruminating and said, 'They're coming here.' And he, he turns out to be quite prescient." Brokaw: "You were with Colin Powell when he went to the United Nations, the centerpiece of the administration's attempt to sell this country on the war. You were sitting behind him when he made that presentation. Was there ever a moment that day, when you thought to yourself, 'We're way out on a limb here?'" Tenet: "No there, there wasn't and subsequently of course we learned that much of what we gave the Secretary to say had turned out not to be accurate and I'll, and I'll say it's, it's an awful thing to reflect on. Secretary of State represents the United States of America and we did not help him and we did not help ourselves." Brokaw: "But just a few months before you had been before Joe Biden's committee in the United States Senate and when you were asked directly whether you had hard, physical evidence, a technical means of collecting this information, you said, 'no.' You were relying on human intelligence. And everything I had ever been told about Iraq was that it was largely opaque. You couldn't rely on the people that you had there." Tenet: "Well, well Tom I'll tell you what, what we know today is, is we got it wrong for a lot of reasons. An over reliance on technical intelligence, not enough human intelligence, history, his denial, his deception. At the end of the day we were wrong. But men and women made honest judgments, stated those judgments and we have to live with that." Tenet: "You write in the book that al Qaeda has been attempting to get nuclear weaponry. Let me give you a scenario and see if you agree that it's plausible and possible. Al Qaeda and especially Osama Bin Laden is believed to be on the western border of Pakistan. Musharraf is in charge of Pakistan, he's one of our principal allies but he's got a terrible situation on his hands with a growing Islamic population and a lot of people who want to protect Osama Bin Laden. He also has a nuclear weapon. And he has in jail A.Q. Khan the man who, based on everything that we know spread nuclear technology around that part of the world. Why has Musharraf denied the United States to have a long, difficult interrogation of A.Q. Khan so that we know what he knows about nuclear weapons?" Tenet: "Well Tom I don't know what's transpired since I left as director but let's, let's say one or two things. One, when I confronted President Musharraf with the evidence at our disposal he took direct action. Two, my assumption is there's a lot of sharing of data between us and the Pakistanis. Three, it may not be perfect and we will always want more and I know my colleagues have been pressing more. Where it is today I don't know but let's give President Musharraf some credit for doing the right thing when we pressed him to do it." Brokaw: "Is there any doubt in your mind that he knows where Osama Bin Laden is and doesn't want to go after him because it could send his country-"
Tenet: "Oh that's, that's speculation Tom. I, I suspect there may be people in Pakistan that know but I don't believe President Musharraf would deny us that knowledge." 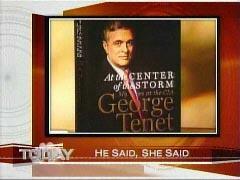 Brokaw: "George Tenet, the author of The Center of the Storm. He'll be back with us again tomorrow and again tonight on NBC Nightly News."